Doreen N. is a senior varsity volleyball player but she excels way beyond the volleyball court. 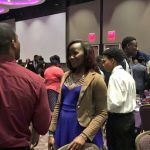 Doreen is a candidate for the TCU Community Scholars Scholarship. This scholarship offers $250,000 to attend TCU in the fall of 2017. We are so proud of Doreen and look forward to hearing if she becomes a finalist.